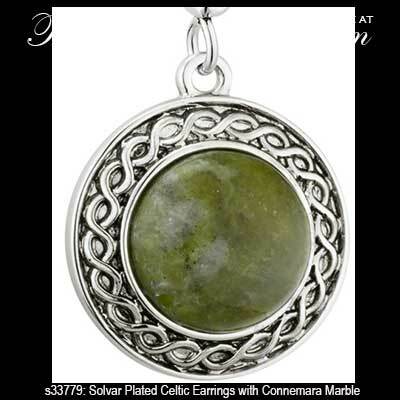 These rhodium plated Celtic earrings with oxidized accenting have polished domes of Connemara marble that are augmented with a knot-work design. The dimensional Connemara marble Celtic earrings are a drop style on fish hooks that measure 5/8" wide x 1 3/8" tall to the top of the wire. 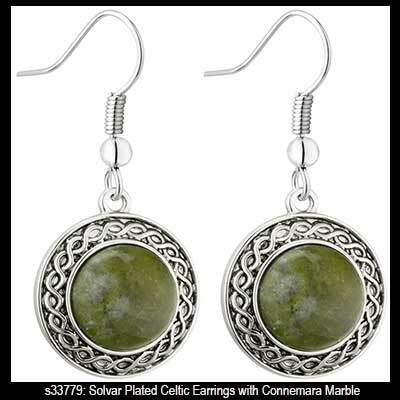 The pair of Irish earrings are made by Solvar Jewelry in Dublin, Ireland and they are gift boxed with Celtic knot and Connemara marble history cards, complements of The Irish Gift House. These Connemara marble earrings, like all the Irish made jewelry at The Irish Gift House, are nickel free and hypoallergenic.